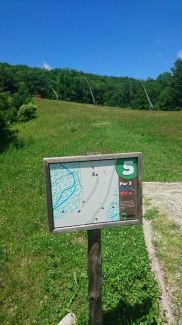 Description: 18 holes with multiple tees in the courtyard of the Jackson Gore Inn and Inn bound ski trail. Mostly short holes with some interesting features. Local Directions: From Ludlow, take 103 north 3 miles. Turn left into Okemo Jackson Gore Base area on Okemo Ridge Rd. First right on Jackson Gore Rd. Park and pay at Spring House recreation center on left.